For a number of years, independent editor Ray Rhamey has been offering free writing advice at his web site, Flogging The Quill. He'll critique your work if you submit the first chapter. He bases his analysis on the first sixteen lines of your work (in other words, the first page), a part he deems critical to catching the eye of an agent, editor, or potential buyer. I've submitted a few things to Ray, and although I don't recall ever getting that ultimate compliment--"I turned the page"--his suggestions have always been helpful. 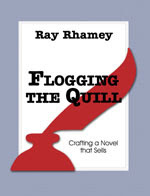 Now Ray has distilled the wisdom he's gained in many years of writing and editing into one book, Flogging The Quill: Crafting A Novel That Sells. If you go to the site, you'll find that Ray has formed his own company to print this book (and that's a whole other subject, which I won't go into at this point). What I will do is say that this book has some of the most helpful writing advice I've encountered in quite a while, illustrated by copious--and I mean copious--examples. It's truly like having an editor on your bookshelf. I definitely recommend it. You can get more details on Ray's book and even pre-order it via this link to Amazon.com. Then again, since you're one of my readers, you might want to click this link and take Ray up on his offer of a free PDF file of the book providing you'll help him spread the word about it. Details are on the web site. And don't say I never steered you toward a good deal. RM: To me, Deceived was like a snowball rolling down a hill—gaining momentum and force as it went along. And just when I thought it was winding down, here came a smash ending. Did you have all these plot twists in your head when you started, or did inspiration hit along the way? JSB: I knew the beginning and the ending, some scenes in between, but mostly the "engine" of my story. Because I knew what was driving it, I was confident about designing the twists and turns. RM: I was impressed with the way you were able to interweave the stories of several characters into the fabric of Deceived, making it all come together so well. Do you keep all this in your head, or do you chart character arcs and story flow ahead of time? JSB: I keep a record of my scenes as I write them. Also, when I'm doing the first draft, I'm writing fairly quickly, to stay in the story, so it's all in my noggin, too. RM: And that brings me to your classic books for writers, Plot and Structure and the companion work, Revision & Self-Editing. Do you ever look at a draft of one of your novels and realize that you’ve failed to follow your own suggestions? Or is it all such second nature now that you can write a clean first draft that’s publishable? JSB: Wow, "classics." And I'm not even dead yet. Thanks, man. Yes, I actually follow what I teach. When something isn't working, I go through a mental checklist. Almost always I relate it to my LOCK system. That means I need more work on the Lead, or the Objectives aren't strong enough, or there's not enough Confrontation going on, for whatever reason. I can also look at my scenes with HIP and see whether I've got a Hook opening, enough Intensity, and if the end Prompts the reader to move on. When I edit, I actually use the Ultimate Revision Checklist that I have in Revision & Self-Editing. And so on. RM: In addition to your Christian fiction like Deceived, you are also the author of the Ty Buchanan series (Try Dying, Try Darkness; Try Fear releases in July). These are published by a mainstream publisher and appear to be aimed at the general market. What motivated you to enter this arena? JSB: Several years ago I found myself turned off by the direction so many general market thrillers were taking in terms of darkness, nihilism, language, explicitness in violence and sexuality, and so forth. I started to think, man, the great film noirs never did this, and they are better than what we have now. I also think a lot of readers out there are feeling the same thing. I wanted to write the kind of books I write, geared toward those kinds of readers. Every bit as suspenseful and contemporary, but not something that makes you feel like you have to take a shower afterward. RM: Tell my readers about your acting career. Are any of the commercials you appeared in still around? And have you come close to fulfilling your dream of appearing in a movie? JSB: You may remember me. I lifted that tray of McDonalds hamburgers and put them on the hot shelf in 1978. But mostly I was doing stage work in New York. I was almost cast in a TV series opposite Karl Malden. I went to the MGM lot and read with him (that was nervous time, boy), but as I was walking off the lot an assistant stopped me and brought me back for more. At the last moment, though, they went with a guy who had a "name." The series was cancelled pretty quickly. Several years later I bumped into that "name" at a fast food place and told him the story. He smiled wanly. He was looking for work at the time. RM: You were an adjunct professor of writing at Pepperdine University and teach at a number of conferences. You have been an encourager and mentor to lots of writers, myself included. Do you have any idea how many people you have taught have ended up having their novels published? JSB: It's getting to be quite a lot. Not more than fifty perhaps, but not under twenty. Just got word yesterday that it has happened for another. Not to say it wouldn't have happened without me, but I see what I do as saving people time. I give them tools they can apply immediately, then their own talent and work ethic take over. RM: And, as one of those “less than fifty but more than twenty” you’ve helped on the road to publication, thank you. Any final words for my readers? JSB: When it comes to medical, writing, or eating-out-in-Texas advice, do what Doc says. 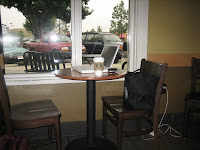 Recognize the table, computer, and bag in the photo? You would if you frequent a certain Starbucks near the home of best-selling author, James Scott Bell. This is Jim's workspace, the place where it all gets done. Legend has it that he doesn't leave here until he produces his word quota for the day. If I couldn't leave my desk until I'd done that, I'd never make it outside to see the sun. Anyway, the point of all this is to announce that tomorrow I'll be posting an interview with James Scott Bell. I hope you'll come back then to see what this author, screen-writer, teacher and "recovering lawyer" is up to this time. Our Sunday school teacher used a new word this morning: "chreia." This is an exercise used to prepare orators and speakers, one of fourteen such exercises (progymnasmata). A chreia uses anecdotes and stories to indirectly portray a figure, focusing on words and deeds. Dr. Jim Altman brought up the term in discussing the book of Mark, which he categorized as a biography that uses chreia. My subsequent reading about chreia and progymnasmata set me thinking about writing exercises. Everyone who has attended some sort of mentoring class is undoubtedly familiar with a number of these. My favorite was the one Karen Ball used one year, when she had us start a story with a central character who was the most hateful, mean, worthless person imaginable. We then had to pass our stories to the person on our right, who was required to write the conclusion of the story while turning the bad person into someone good. I found it to be a great way to stretch my imagination. Try it sometime with a writer friend. There are all kinds of writing exercises available, many of them just a Google click away. I particularly like the ones mentioned in this writing website. I don't like to do the exercises--too much like work, I guess--but they are a great way to tone up your writing muscles. If you decide to work on your chreia and the other thirteen features of the progymnasmata, you can go to this site. As for me, I think I'll pass. But at least I've learned a new word to drop into my conversation the next time I'm around either writers or Bible scholars. "Of course, the gospel of Mark is a classic biography, rich in chreia." Try to find that in your word-a-day. The current issue of Writer's Digest is worth reading. If you aren't a subscriber, try your local library for a copy, especially if you've been agonizing over whether to go the self-publishing route or not. In the March/April issue, the staff gives a succinct and (in my opinion) unbiased assessment of the pros and cons of this thorny issue. In the end, publisher and editorial director Jane Friedman sums it up this way: "Self-publishing can be easy, affordable and satisfying--but marketing, selling and promoting can be difficult." In the same issue, you have Michael Crichton's top five writing lessons, some great writing exercises from Dr. Charles Johnson, some excellent rules for self-editing, and five easy tips for strengthening your scenes by James Scott Bell. I know...I said I was going to be gone for a few days. We changed our plans, so I have a couple more days to work at home. My agent had a great post today about rejection. (While you're there, read my comment with some of my own rejection stories). She hates to turn down queries, and I've come to find that she's not alone in that. There may be a few agents and editors out there who enjoy crushing the hopes and dreams of aspiring writers, but they're in a definite minority. Her post reminded me of this blog post detailing a rejection letter that probably lets the recipient down as easily as any such missive could. You can read the letter by going to this site, clicking on the letter, then clicking again to enlarge it. For many years I was on the editorial board of several prestigious medical journals. The rejection rate for professional papers at that time was about 85%. Now it's somewhere near 90+%. It was always difficult to reject papers that, had there been unlimited space, would have been publishable. But the harsh reality was that only the absolute best of the ones crossing my desk would be published. Of course, my own professional papers got turned down as well. Although I had over 100 of them published in a 35+ year career, I still was "turned down more times than a Holiday Inn bedspread." Rejection. It happens. I hope you won't let it stop you from doing what you love, whether it's writing or (since spring training is about to start) working on your curve ball. I never made it out of semi-pro baseball to the majors or even the low minors. But that didn't stop me from trying. Hope you'll do the same, and keep pursuing your dreams despite rejections. I'm currently reading a novel in which one of the characters says civilization has been declining since the invention of smoke signals. His theory is that, until that time, all communication was face-to-face. As we distance ourselves from others, communication has become more impersonal. I'd have to add my own observation: we're no longer communicating, we're emitting signals but no one has time to read them. I follow a number of blogs, almost all of them writing-related. I use Google Reader to notify me when something new is posted on these sites. I open the Reader once or twice a day, read through the titles and first few lines, and decide whether to invest the time in reading them. And I'm careful not to spend all my time doing this--because it's possible to let blog-reading and commenting take over your day. I asked a number of people how many blogs they read. The results were interesting. A number of responses included the comment, "I don't have time to read blogs." The busier the person, the less time they spend on blogs and social networking. Makes sense, I guess. You can't be reading and writing at the same time. And I don't know how many times I've heard from friends who say, "I've got to shut this down and get some work done." I also use Twitter. As I've posted before, I've already stopped following some folks on Twitter because their frequent tweets have just worn me down. Now I use it to follow a small group of friends with whom I enjoy the closer contact this medium allows. As for FaceBook, I have only a nominal presence there. My tweets go to my FaceBook page and I get emails when someone posts on my wall (and for those of you who don't do FaceBook, it's sort of like your first trip to Starbucks--you have to learn the language). Again, all this can take over your life if you let it. I'm trying very hard to avoid that. Is there a point to all this? Well, to begin with, if you're reading this blog I appreciate your taking the time to do it. Other than that, I'd like to ask how you self-limit your involvement in blogs and Twitter and FaceBook and all that stuff. Any suggestions? I'll be away from the keyboard for a few days. Talk among yourselves, and the last person out of the chat room be sure to turn off the lights. I've been installing drawer pulls this morning. The single knobs are easy, especially since I found this neat little plastic template that lets you place them uniformly on every door and drawer. The larger pulls, the ones that require two screws, are a different story. I used cardboard to make a template, marked the location of the holes, then drilled to make the openings. Unfortunately, I was just a tiny bit off in my measurements, so the second screw didn't quite fit into the hole in the drawer pull. Ever try to stretch a piece of metal? Won't work. Instead, I had to enlarge the hole I'd drilled so I could make the screw fit. I'd forgotten something I learned from my grandfather (a carpenter) and my father (a man who could do anything with tools). "Measure twice, cut once." How many times in life do we forget that axiom? Not just when doing a project around the house, but in everything we do. Take communication. When writing a letter required taking paper and pen and writing out our thoughts longhand, we might have been a bit slow to send one. The typewriter and word processor made things even easier. Now, we just snap off an email. Unfortunately, it would often be better for us to think over what we're saying--to "measure twice" as it were--before hitting the "send" button. As a writer, I learned from one of my mentors to "Get it down, then get it right. You can correct it in the second draft." And, with very rare exceptions, all authors do a second draft...and a third...and so on. Then the work goes to the agent, then to an editor (often several editors) before it is ever printed. This is another example of "measure twice." I've recently gone back and read the first draft of the very first novel I wrote. I had very little understandings of the basics of fiction writing. In this case, I needed to measure a lot of times before I was ever ready to cut. I'll make an effort today to think about my words and actions before going forward with them. And, on what would have been his ninety-fifth birthday, I'll recall the lesson learned from my father: "Measure twice, cut once." A number of my friends are having a difficult time juggling all the things life throws at them. I understand--been there myself. There are the things we want to do, the things we must do, the things others expect us to do, the things... Well, you see where this is going. And most of you are nodding in agreement. Just yesterday I was asked, "What kind of doctor are you?" I'm always tempted to answer, "Retired," which sort of cuts off the conversation. Instead, I generally say that I'm a retired ear, nose & throat specialist who's now writing full-time. That leads to the usual follow-up questions, giving me an opportunity to tell them about my non-fiction book and my forthcoming novel. But when I said, "writing full-time," a little bell went off in my head. Writing full-time? Sometimes it seems that I don't even write part-time. Instead, often spend my days putting out fires and dealing with the unforeseen. I'll bet you do, as well. My agent is hard at work today after four hours' sleep, dealing with over 150 items in her inbox. She's supposedly working full-time as an agent, but I know that she's also functioning as a wife, mother, church member, and a person. She's handling what life throws at her. During my decade as a professor at a medical school, I was involved in interviewing graduating medical students who had applied to receive postgraduate specialty training in our department. They showed up in their suits and tailored dresses, a veneer of confidence covering their nervousness. I soon found that they had prepared well for the interview process, with carefully thought-out answers to just about every question we could ask. But then I came up with one that always caused them to pause and really think before answering, a question that let me know whether there was any depth to what I saw on the surface. "What would you like said about you at your funeral?" When you reach my age, you've attended a lot of memorial services. I've listened to a lot of eulogies and given some of them myself. And I never do that without wondering what would be said of me at my final service. I hope it won't just be, "He was a doctor," or "He was a writer." I'd like it to be, "He was a fine Christian, a loving husband and father, who did his best." All the rest can be a post-script. Thomas Nelson Publishers has been kind enough to make copies of selected books available to some of us in exchange for our agreeing to read and review them. The review doesn't have to be glowing or positive. Honest assessment works. Having given you the circumstances under which I obtained this book, here's my succinct opinion about The Great Eight: How To Be Happy When You Have Every Reason To Be Miserable. In this book, Scott Hamilton (with writer Ken Baker, also a cancer survivor) uses situations from his life to share advice that has helped him find happiness and fulfillment in the midst of struggles with two tumors, professional disappointments, financial reverses, and things that would embitter most of us. Most of us recall Scott as one of the best figure skaters in the world. He went from an Olympic gold medalist to professional stardom, and then his world began to crumble. He developed testicular cancer, and later was diagnosed with a brain (pituitary gland) tumor. He lost his contract with Ice Capades. His interpersonal relationships went south. If anyone had reason to sit in a corner in sackcloth and ashes, it was Scott Hamilton. In the book, he begins by detailing his hard work to master the compulsory figure 8 (unfortunately, no longer required for figure skaters), and follows this with eight chapters that set forth the things he has learned that have helped him through his own tough times. The narrative is a bit jumpy and some of the stories and sayings are repeated several times in different chapters, but there is good advice in the book for those who take the time to dig it out and--more important--follow it. A few years ago, an editor told me, "I want to see you writing medical suspense like Michael Palmer." To that point, I'd never read any of Michael's books, but you can bet that I hastened to remedy that deficiency. After that I was hooked. I can never hope to write as well as Michael, but I have been fortunate enough to develop a cyber-friendship with him. Today I'm pleased to present this interview with Dr. Michael Palmer. He is a man of many talents, and I admire the way he balances writing, medicine, and family. His latest book, Second Opinion, hits the bookstores this month, following on the success of his last novel, First Patient. RM: Michael, I’m looking forward to reading Second Opinion. You seem to turn out about a book a year. Is that your best writing speed, or is that all the time you can spare to write? MP: Neither. The publishing business has changed. It began with Grisham, I think, though I am not sure. A book-a-year has become the minimal standard. Some heavyweights are no longer bound to this, but most successful fiction writers are. In many cases, it’s write a book-a-year, or don’t get paid. I assume the publishers have figured out that the reading public responds to this with more sales. It also allows them to have a soft cover in the stores (and on the best seller lists) while the hard cover is about to come out. They can put advance chapters of the next book at the back of the last one. The Second Opinion is the last of a three-books-in-three-years contract. I am now on The Last Surgeon – first of a four-book contract. My best speed would be a book every two years. I can “spare” as much time to write as it takes to get the book done well. It’s what I do. RM: In Second Opinion, you focus on Asperger’s Syndrome. That’s something that most people don’t know much about, although it’s a serious problem. What made you choose this disorder for inclusion in the book? MP: Here’s the introduction to the author’s note at the end of The Second Opinion. It pretty much explains everything. “Fourteen years ago, my wife and I sat numbly in the office of a child development specialist and listened to him tell us that our beautiful four-year-old son had Asperger syndrome, a form of autism. He said much, much more, but as you might suspect, the only word we really heard that day was AUTISM. “We did not know it at the time, but we were on the edge of what was about to be an explosion in the field of so-called autism spectrum disorders, as well as an alphabet soup of related diagnoses such as ADD (attention deficit disorder), ADHD (attention deficit hyperactivity disorder), PDD (pervasive developmental disorder), PDD-NOS (not otherwise specified), NVLD (non-verbal learning disabilities), and others. “Now, after years of groups, therapies too numerous to mention here, specialists, and intense parental involvement, Luke is a witty, creative, sensitive, kind, insightful, and utterly interesting young man, who has been a joy to be around, and has a boundless future. There are and always will be situations that are challenging for him, but the same is true for all of us. RM: You’ve had twelve best-selling novels published, something about which most authors can only dream. Yet you continue your “day job” with the Massachusetts Medical Society. What drives you to keep two careers going? MP: I love taking care of people and being a doc. If money wasn’t an issue and I didn’t have a kid going into college, I might choose to do medicine full time. But I also love writing and we have little of “managed care” in writing (although see question #1 above) Right now I love the balance I have in my life. RM: You mentioned that you’ve just signed a contract for a four-book deal with your publisher, St. Martin’s Press. Does that make you feel more secure, or just keep you awake nights worrying about thinking up new plots and meeting deadlines? MP: I do my life a-day-at-a-time, around the principle that I can only do what I can do. Your readers who don’t believe that should try and implement it. RM: As a physician, do you get inquiries from other authors with medical questions to which they need answers for their own novels? And, if so, how do you handle it? MP: Not really in terms of medical questions, but I get many inquiries about getting published and finding an agent. I refer most of those to my web site. People with medical questions I refer to the Internet, where I go to validate even medical questions to which I know the answer. RM: I’ve heard you say that you always have time for your son, and I admire you for that. How do you manage to balance writing, work, and family? RM: And, as always, any last words for my readers? MP: The book business is on shaky grounds. Numbers are way down. Electronic publishing is a big unknown. It is essential for readers to support their favorite authors more than ever, and to take chances on new ones. Buying a book – even a hardcover one, is such a cheap form of entertainment compared to tickets to things. In addition, when you are done with a book, you can share it with your friends, and when they are done, you are left with a rather nice piece of furniture that can entertain you again for hours in the future. Thanks for dropping by, Michael. For the writers in my audience, please note the tab on Michael's web site with helpful information for writers. And for anyone who enjoys suspense fiction, especially medical suspense, pick up one of his books. You won't regret it. Thanks to the good folks at Writer Unboxed, I found this site from the UK. It's a great way to test your spelling expertise, but the accent of the folks pronouncing the words made it a bit hard for me at times. Test yourself at The Times Spelling Bee and see how much you've forgotten since you were in school. Point of View: "Tis A Puzzlement"
For the writer of fiction, one of the most puzzling problems is "point of view." 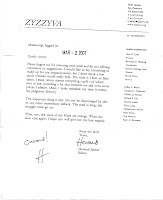 I recall seeing the critiques of my first novel laden with notes about point of view--"make this close third person," "you've slipped into omniscient," and similar phrases that might just as well have been Aramaic for all they conveyed to me. I tried my best, honestly. I slogged through Mastering Point Of View and came away with information overload. I asked several writers to explain. I studied. But it took quantum physicist Randy Ingermanson to make it simple (go figure). Randy told his mentoring group, "Imagine a camera recording the scene. Where's the camera?" Of course, that's an oversimplification, but it helped me begin to understand. The three major types of POV are omniscient, first person, and third person. Omniscient--where the narrator is able to see things from everyone's perspective--is less popular than it was years ago, probably because it's more distant and less likely to make the reader identify with characters. First person--told through a single narrator, from his viewpoint and with his thoughts and reactions--is good when you can pull it off. Robert B. Parker does it beautifully with his Spenser novels. I tried it once, but gave up after one chapter. It's tough. (And that's why agents and editors tell neophyte writers not to try). That leaves third person--told from the perspective of one person, revealing what they see and think. Close third person just means getting further inside their skin and giving the reader a more intimate view. Most writers of fiction choose this approach, and with good reason. The non-writers reading this are already yawning. The writers are asking, "So? I know that...or think I do. What's your point?" Glad you asked. I've been noticing how many of the novels I've recently read have sections where the POV slides from the perspective of one character to another in the middle of a scene. Established writers can get away with it, but it sort of disappoints me. Even John Grisham, in his latest novel, has a bit of head-hopping early in the book. Consider this scene. The protagonist is in trouble and being questioned by police. As we have been since the beginning of the novel, we're in the head of the protagonist: "(His) flash of anger was gone, replaced by the crush of confusion and fear." Great word choices, paints a good picture, definitely in the protagonist's POV. But, same scene, about a dozen lines of dialogue later, suddenly the detective "didn't like the...answer, but decided to let it slide. He knew that..." See, this either has to be omniscient POV or he's head-hopping. I took it for the latter. In either case, it seems that it would be a lot cleaner to keep the POV consistent throughout the scene. The transition is a bit jarring to me. So, back to work, always conscious of my POV as I write. I think keeping it consistent makes for better reading and more identification by the reader with the character. But, that's my opinion. What's yours?